Beat The Freshman 15 Weight Gain! Although parents may snicker about "The Freshman 15", it is a real weight gain phenomenon that has been studied intently by medical researchers, exercise physiologists, and even family counselors. The name "Freshman 15" makes it sound like this weight gain only takes place in a student's first year, but it can actually stick with individuals throughout their entire lives if left unchecked in college. The culprits in college weight gain are directly linked to the approach toward independence by each student. * Students are no longer required to take a PE class. * Students can eat whenever they want...and whatever they want. * College cafeterias are stocked mainly with starchy carbohydrates. * Pizza, beer, and pop are the staples of most social gatherings. * Students choose sleeping, the Internet, and listening to their iPod over physical activity. If you are truly intent about avoiding the Freshman 15 weight gain, you must adopt both increased awareness and a mature approach toward your personal fitness. Being in college doesn't mean you put your health on auto-pilot. The more informed you become about your body, the more you will be able to avoid situations that sabotage your future health. * Calories are the watchword. You gain weight and put on belly fat when you take in more calories than you burn. It is a simple equation. * Sugar foods, fast foods, and processed foods are the enemies that lurk in the college cafeteria and surrounding campus eateries. Recognize them and avoid them. * Educate yourself about what foods are most easily stored as fat on your waist and hips. * Always eat consciously, not mindlessly. Know EXACTLY what you are putting in your mouth each time you eat. 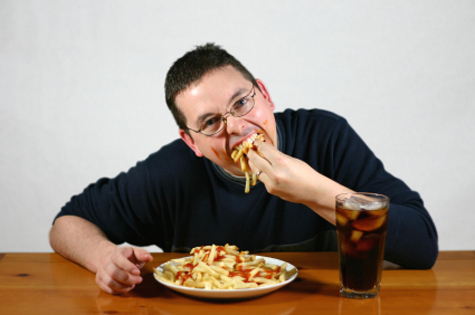 * Learn what feelings and situations pull you toward mindless eating. Work on overcoming them. * Commit to being active everyday for at least one hour. You can workout at the campus fitness center, run/exercise on the track, walk briskly around campus...but BE ACTIVE. Get away from the computer, get away from your cell phone. Commit to YOU! Becoming more aware is a process of maturation, yet you accelerate it when you commit to a personal health/fitness plan. You do not have to tell anyone about it. You do not have to be rigid about it. * ALWAYS eat a good breakfast. It is the most important meal of the day. Stay AWAY from sugar cereals and pastries. * Start choosing more fresh fruits or vegetable sticks for snacks. * Whole-body workouts that focus on multi-joint lifts (bench press, squats, pull-ups, rowing, dumbbell presses) help you build lean muscle tissue to increase your metabolism naturally. * You should have a cardio component at least 3-4 days each week. Set a goal to become strong enough to integrate interval training into your sessions. * It is good to follow a proven program to burn belly fat and build lean muscle tissue. The Truth About Six Pack Abs has helped 1000's of young adults get the body they want. You can make a conscious decision to beat the Freshman 15 weight gain. You have it in you to become more aware and more mature in your outlook. The education you get by becoming the expert on your own body will prove every bit as valuable as the one you receive in your major.